Believe it or not, you can earn money online by listening to and reviewing music. By signing up to the following online review sites, you can make money whenever you review a piece of music and comment on its quality. That’s not the only way to make money however. There are some companies that will pay you to transcribe lyrics of songs, provide feedback for new artists, or even simply listen to your music. The key is to sign up with as many of the sites below. The number of people who want to do this is high and the opportunities are few, but by signing up for everything you maximize your chances to really make some money. It’s going to be a little challenging to simply throw on some tunes and rake in the cash (well, with the exception of #1 on this list who will pay you to do exactly that) but for the true musicophile, there are quite a few options below that will have you listening to music and earning money at the same time. Nielsen will pay you to listen to your own music. They conduct market research and want to know how you use your devices, including what kind of music you listen to. All you need to do is download an app, and they pay you $50 per year, per device. If you have 2 phones, 2 laptops, and a desktop, that’s $250 in your pocket for listening to your own music library. Plus, you get entered to win $10,000 every month. If there’s one program you join from this list, make it Nielsen. 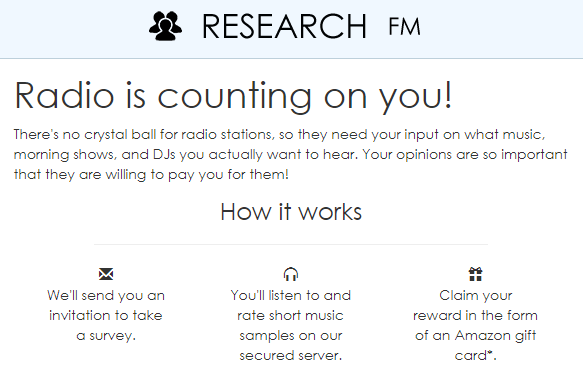 This website pays you for not only listening to the radio, but also for completing surveys, viewing videos, and completing online offers. While Earnably is a part of RadioLoyalty, it offers additional points for members who also complete the previously noted tasks. What’s especially beneficial with Earnably is that the site pays you bonuses and increases your payout options as you advance on the site. It takes just $2 in collected earnings before you can request a payout through Paypal or a gift card. This site features musical artists who want feedback on their compositions. By leaving such feedback, you’ll earn cash online. After you sign up to the site, you’ll be asked to listen to and reviews music pieces. You need to listen to a piece of music for at least 60 seconds before completing your review. If you put in a good faith effort on your review, you won’t have any trouble making money with this site. Just keep in mind that Slicethepie wants quality reviews, not fluff. Payment ranges from 2-20 cents per accepted review, with the minimum payout being $10. Want to help out new music artists? 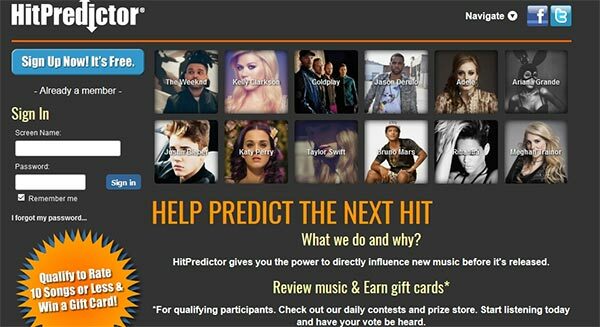 With HitPredictor, you can provide valuable feedback on new tracks before they go big. 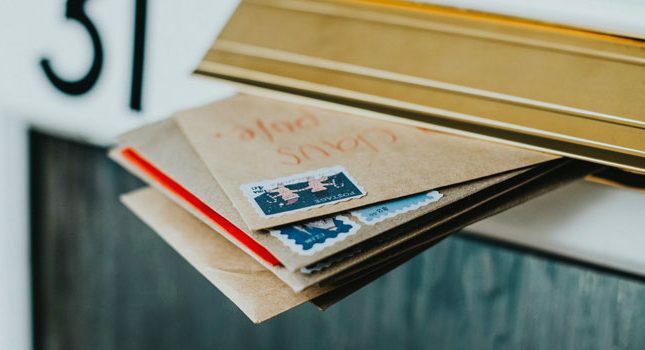 Once your feedback is submitted and accepted, you’ll earn points. Bonus points are distributed to reviewers who submit a given volume of reviews within a set time period. The current exchange rate for accepted reviews is 3 reviews = $1. Once you’ve collected enough points, you can trade them in for prizes, Amazon gift cards, etc. With FusionCash, you can earn money by listening to Internet radio from your computer. Even better, the site rewards you with $5 just for signing up. 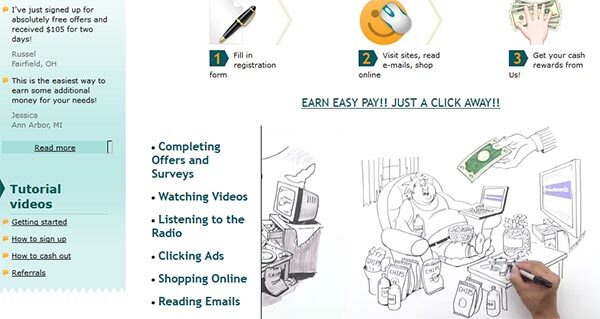 Aside from listening to online radio, you can earn money by filling out surveys, completing offers, and referring others. The minimum cashout amount is $25. What’s really nice about FusionCash is that you can also join its online forum, where members can help answer your questions about the site, how to maximize your earnings, etc. RadioLoyalty is Internet-based radio that pays you to listen to its music. You can listen to different stations and/or music genres via your desktop or apps that you download to your iPhone or Android device. Why would RadioLoyalty pay you to listen to music? Like many radio stations, RadioLoyalty is funded by advertisements. When you listen to the music that’s played on RadioLoyalty, you also hear advertisements every few minutes. To ensure that you are in fact an active listener, RadioLoyalty has you sign in through its CAPTCHA every 3-5 minutes. You are paid out in points for every 10 minute segment of time. Collect enough points, and you can trade them in for prizes or VISA gift cards. This site will also pay you to listen to music submitted by new and upcoming artists. 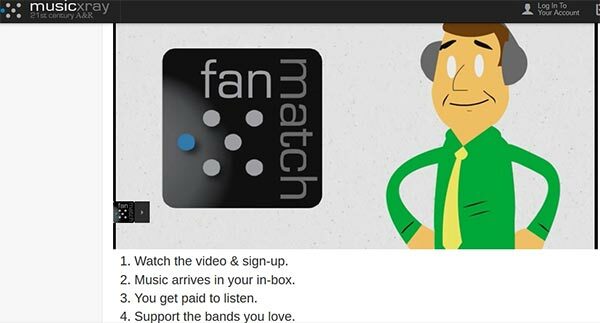 Even better, you can direct the site to provide you with music suited to your tastes through its FanMatch program. As a Musicxray “music fan,” you’ll be rating new tracks and artists by filling out surveys. Occasionally, you’ll be asked to participate in focus groups. The pay is currently set at 10 cents per rated song. Payout via Paypal occurs once you reach a threshold of $20. This site pays you to complete all kinds of online tasks, including filling out surveys,visiting websites, shopping online…and listening to Internet radio. If you decide to listen to Internet radio, you’ll earn money every time you enter the site’s CAPTCHA. In the USA, you’ll be rewarded 3 cents per CAPTCHA fill; in Canada and the UK, the payment is 1 cent. Payout occurs once you reach a threshold of $20. This site, which is also available as an app on for your iPhone or Android device, pays you to provide feeedback on new songs via emailed surveys. Once you earn enough money, you can redeem it by purchasing Amazon gift cards. Sign-up to Research.fm is currently by invitation only; however, a contact form on the website can be filled out and submitted if you’re interested in joining. Welocalize is a transcription service that pays people to listen to music and then type out the lyrics. They are currently paying $4 per song transcribed and they are looking for people all over the world to help them build up their database of lyrics. All you need to do is watch the introduction video, fill out the short application, and start transcribing. You won’t become a millionaire by rating online music, so don’t quit your day job just yet. Instead, treat these gigs as extra cash that you can make on the side. To get the most bang for your listening buck, you should sign up to all the listed sites. This way, you can listen to just one song and review it multiple times on each site. Remember to change your actual review text as you hop from site to site. Being a member of all these recommended sites will also provide you with a steady stream of gigs because not all sites have available reviews at all times. If you fancy yourself as more of a music creator than a music listener, you may also want to check out my guide on online jobs for musicians. There are quite a few ideas in there that I bet you never even knew were a possibility. Oh, there is definitely a catch, all right, not that you are likely to get any trouble from it. These sites are only actually sound gigs for those whose taste is kept largely mainstream. I fail that criterium, and miserably. With a taste and passion for some of the most unusual genres and artists, non-canonical classical composers, Slavonic opera, eastern and northern European folk music. I would mention some of my favourites but for the fact nobody understands what I am talking about anyway. This can be a delightful way to earn on the side. I sometimes find myself looking for new and interesting music to listen to whenever I want to relax. I’d definitely welcome any worthwhile opportunity to earn extra while doing something I enjoy. It’s also a good opportunity to help aspiring music artists. Thanks for sharing this post. I didn’t know that you could make money by listening to music, and if you are a lover of listening to new music, then why not get paid to do what you enjoy. As you say, one couldn’t do this full time and give up your day job, and I think you should only do this if you really love music, or you will be disappointed in the small change you get for doing this. In your opinion, which of these music sites is the best experience? Perfect, this sounds like an excellent option for someone who loves to listen to music while doing just about everything else. A little bit of extra cash for doing something you were doing anyway is always a good deal. Are these programs available worldwide, or just for residents of the USA or UK? Wow I didn’t realize you could actually get paid to listen to music, that’s crazy! However, it sounds like you may get stuck listening to music you have no interest in. I wonder if you can at least pick out a specific genre to listen to? Personally, the amount you would get paid doesn’t seem like it would be worth it unless you could enjoy it. What do you think? That’s a good point about leveraging your time by reviewing the same song on several sites. There are actually a large number of people doing just that in Baltimore. All in all it’s a cool way to earn extra cash. Thanks for the insight, I really had no clue. I might take it up. Interesting article on earning extra cash online by listening to music, so what is the catch? I have seen a few of the programs around online, some are new to me. 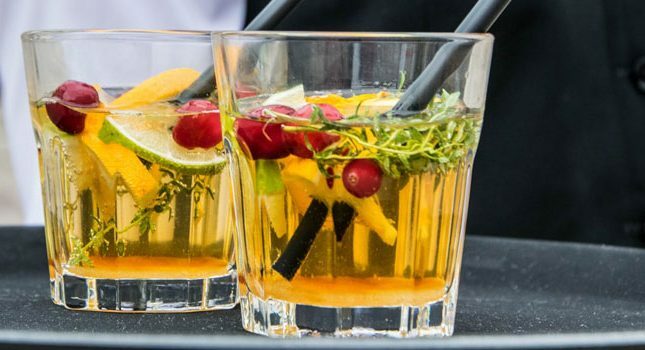 I tried a few of these but it is time consuming and you do not earn much at all with these programs, maybe if you are doing them all you can make it out better? How long have you been using these programs, has it really been worth your time? There isn’t a catch really. You’ll make money doing so but it’s not going to be the “quit your job” kind of money, but instead it’s a nice way to earn some extra cash in your spare time.